Rising population and low mortality rate seems to be the reason for lucrative growth in the healthcare sector. This will in turn give a growth to global pharmaceutical and chemical market. Increasing demand for better healthcare system across the world is expected to drive the market. Swell in the geriatric population calls for increase in healthcare facilities. This is expected to boost the market ahead. The global pharmaceutical chemical market is projected to grow at a CAGR of 6.1% during the forecast period 2018 to2026. Last year it was estimated to have generated a revenue worth US$ 167,718.2 million. It is anticipated to swell up to US$268,833.5 million during the forecast period. Regionally, Major share of demand is likely to arise from developing nations. Huge population in developing countries and constant need for healthcare facilities is likely to be the cause for push in the global pharmaceutical chemical market. Europe is also projected to flourish and create new avenues for the market. Therefore, pharmaceutical chemical industry will see surge in the market during the forecast period. Additionally, rise of manufacturing of advanced drugs will drive the market. Alternatively, development of drugs like glutamate modulators to treat neurological issues will push the market. 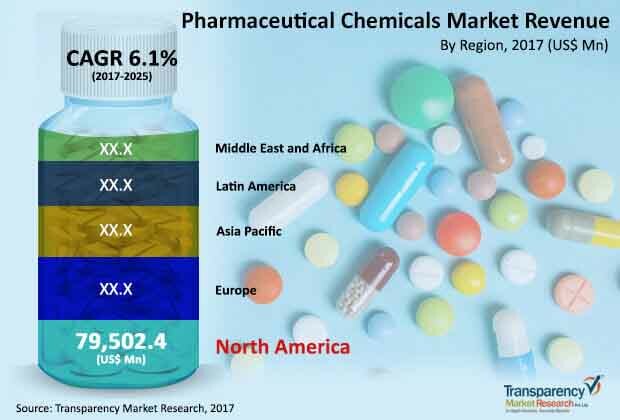 Global pharmaceutical chemical market is projected to be flourishing in coming years due to rise in demand for drugs for non-communicable diseases. Furthermore, increased demand for better purchasing power in healthcare facilities will expand the market. Cases of increased surgeries, need for improved healthcare infrastructure is projected to fuel the pharmaceutical chemical market during forecast period. Building blocks segments of pharmaceutical market is likely to widen the market during forecast period. Need for allocation of huge capital may act as a deterrent. Also any drug needs to abide by the clinical trials, approvals from regulatory authority. These factors may affect the market to some extent. However, developments in all the fields of healthcare facilities and rising geriatric population is projected to inflate the global pharmaceutical chemical market. Various therapy based applications are expected to increase the demand for global pharmaceutical chemical market. Demand in increase in cardiovascular, neurological, gastrointestinal, musculoskeletal cases will surge the demand for pharmaceutical chemical market. It is projected that cardiovascular diseases would see a boost in the manufacturing of drugs. Continual research and development in pharmaceutical chemical market will also add to the expansion of the market. This will further push the market for global pharmaceutical chemical application in such cases. Also, medical insurances are being made available to people to deal with medical needs. These chemicals forms a basic ingredient in manufacturing drugs. Hence, the global pharmaceutical chemical market is always under the scanner to maintain high safety standards. Thus, pharmaceutical chemical market is likely to see a flourishing market in coming years.